Mumbai: Of the top 10 carbon polluters in the world, India and Canada are the only two nations making clear progress with measures to deal with climate change, a new analysis has concluded. But India’s efforts will still not be enough to limit global warming, worsening India’s ongoing farm crisis and deepening its income inequalities. 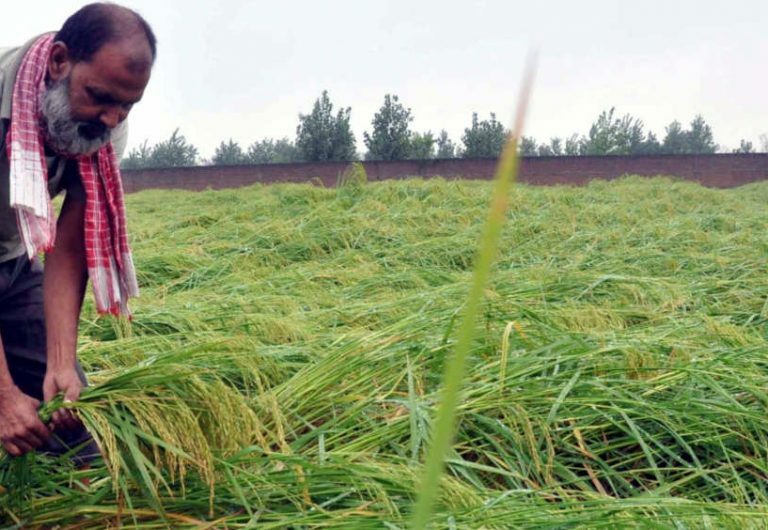 Faridabad: A farmer inspects his crops after rains left them damaged. If all countries managed to achieve all their climate commitments, the earth will still get 3°C warmer by 2100, twice the 1.5°C limit agreed upon in the Paris Agreement of 2015, according to the report released by Climate Action Tracker (CAT), a consortium of three research organisations that analyse climate-change policies of 32 countries. The report was released on December 11, 2018, in the recently concluded 24th Conference of Parties (COP24) of the United Nations Convention on Climate Change. Representatives from 196 countries and European Union met in Katowice, Poland to set guidelines to implement the 2015 Paris Agreement. The countries signed the Katowice Climate Package after a two-week long discussion and negotiation. “The guidelines contained in the Katowice Climate Package provide the basis for implementing the agreement as of 2020,” said Michal Kurtyka, economist and President of COP 24. But states already dealing with devastating floods, droughts and extreme weather made worse by climate change said the package lacked the bold ambition to cut emissions the world needed. “Urgent adaptation needs of developing countries have been relegated to a second-class status,” said Wael Aboulmagd, Egyptian ambassador and chair of the G77 plus China negotiating bloc comprised of developing countries. 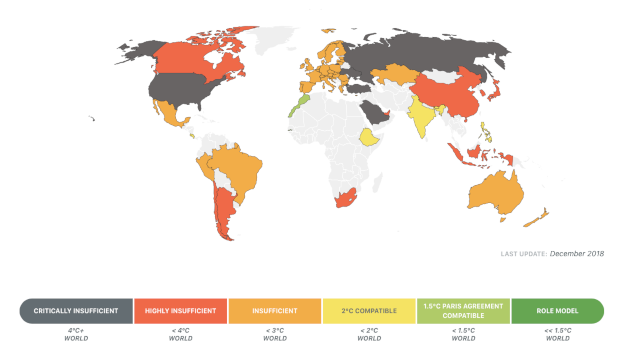 Countries clashed on how to recognise the Intergovernmental Panel on Climate Change (IPCC) special report on 1.5°C and whether to clearly state the need for greater ambition to stay below this temperature limit, Carbon Brief, a UK-based website that covers climate science and climate and energy policy, reported on December 16, 2018. Climate-related risks to health, livelihoods, food security, water supply, human security, and economic growth are projected to increase with global warming of 1.5°C and increase further with 2°C, said the IPCC special report released on October 8, 2018. CAT rates the policies of the countries it analyses in terms of the temperature rise they could lead to. None of the 32 countries featured in this analysis have policies that will keep global warming under 1.5°C. Only Morocco and The Gambia complied with the Paris Agreement’s goal of limiting the temperature rise to 1.5°C. Also, global CO2 levels rose in 2017 after a three-year break and greenhouse gas emissions reached a record high as per the Emissions Gap Report, 2018 by United Nations Environment Programme (UNEP) released in November 2018. There is no sign this trend will reverse, the report noted, adding that nations would need to triple their efforts to meet the Paris Agreement targets. Unless emissions are rapidly reduced, temperatures are expected to rise, leading to runaway climate change as early as next 10-12 years, predicted a November 2018 report by Climate Trends, a Delhi-based climate research firm. Events related to global warming such as floods, droughts, heat waves and cyclones will impact the world’s poor more and will push them into further poverty, stated the report, released on November 30, 2018, in New Delhi. People exposed to natural hazards in low-income regions are seven times more likely to die, and six times more likely to be injured or displaced, compared to those in high-income regions, said the Climate Trends report. Although absolute economic loss is higher in high-income areas, it is the poor who will lose a bigger part of their assets and income, as per a 2016 World Bank report titled, ‘Shock Waves, Managing The Impacts of Climate Change on Poverty’. Poor communities tend to hold most of their wealth in forms like housing or livestock which are less resistant to natural hazards. In a flood, for instance, houses in a slum are more likely to be destroyed than those in the more affluent quarters of a city. Natural disasters also mean exposure to diseases and loss of livelihood for the poor. By 2050, Chhattisgarh and Madhya Pradesh will be the top two climate hotspots and the living standards in these states will reduce by 9%, predicted the report. Rajasthan, Uttar Pradesh and Maharashtra take up the other three places in the top five. India will witness two contrasting trends in the future: There will be more extreme rainfall which will lead to floods and a weaker monsoon which will lead to less rainfall over central India, said the report by Climate Trends. Such erratic rainfall patterns will affect the food security in the country where 56% of the farms are unirrigated. A 1°C rise in temperature reduces farmer incomes by 6.2% during the kharif (winter) season and 6% during rabi (monsoon) season in unirrigated districts, IndiaSpend had reported on March 22, 2018. And for every 100 mm drop in average rainfall, farmer incomes fall 15% during the kharif season and 7% during rabi. This will affect India’s food security, leaving its poor more vulnerable to rising food prices. It will also impact over half of India’s population which is dependent on the agricultural sector. Climate change affects those living in rural areas more those in urban areas, said the Climate Trends report. This is because rural communities--with less access to market, capital and insurance--have fewer resources to cope with a disaster and rebuild themselves. The impact of climate change is not just limited to those living in extreme poverty. By 2030, the income of the bottom 40% people will reduce in comparison to scenarios without climate change, predicted the 2016 World Bank report. More than 100 million people may be pushed into poverty, it added. This widening of the wealth gap and the impact of climate change on worsening poverty will be much smaller in countries where development is rapid, inclusive and climate-informed, stated the report. The 2016 World Bank Shock Waves report considered two scenarios--‘prosperity scenario’ and ‘poverty scenario’--to understand the effect of the world’s current choices in fighting climate change. 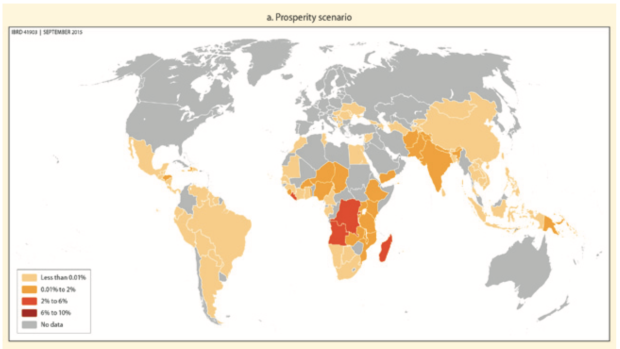 Prosperity scenario assumes that extreme poverty in the world will have been reduced to less than 3% by 2030. 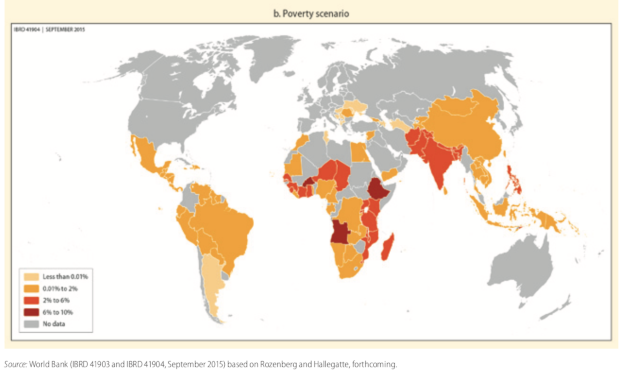 The poverty scenario assumes that 11% of the population will continue to remain in extreme poverty. The effects of climate change on poverty are significantly reduced in the prosperity scenario as compared to the poverty scenario, the study found. Governments need to choose pro-poor and inclusive development policies to reduce the long-term threat of climate change, stated the report. Further, targeted actions in agriculture, health and ecological sectors to make those living in poverty less vulnerable to climate change may help reduce the wealth gap.